A huge thank you to Family Christian for sponsoring this post. All thoughts are my own! Valentine's Day is almost here! Love is in the air...and with love comes marriage! Is there anything greater than marrying the one you love? Is it any wonder that we are so anxious to celebrate that newly married feeling? When we get married, for most of us, we cannot imagine marriage being anything other than sunshine and roses. But let's be honest, a marriage takes work. No matter how solid a marriage is, life is known to throw us curve balls that can put even the strongest marriage to the test. My husband and I recently celebrated our 8-year wedding anniversary...and looking back, it's been quite an 8 years! Together we have been through multiple deployments, cross country moves, raising a child with autism, a miscarriage and most recently, leaving the Marine Corps. We have had financial ups and financial downs. We have had positive experiences...and we've had negative experiences. Life has happened. And through it all, we have remained because we knew going in that life was not always perfect, but agreed to stick through it no matter what...and that's just what we've done. And I have to say, I still find myself loving my husband more and more each day! Despite all the hardships life has thrown our way, I would not trade our time together for anything in the world...and would marry him all over again if I could (and we do plan to renew our vows in a few short years!). So today, rather than celebrating that young love...we're celebrating the love that has lasted. We're celebrating those who have stuck together in sickness and in health, good times and bad. We're celebrating those couples who have been through the fire and came out on the other side. We're celebrating the marriages that have overcome all odds. No matter how long you've been together or what you've been though, isn't marriage always worth celebrating? Mr. & Mrs. Plaque: I loved these from the moment I saw them. Featuring verses perfect for every married couple, they serve as a great reminder of the love we share. And are absolutely gorgeous in any room as well. Mr. & Mrs. Mugs featuring Ruth 1:16: "Where you go I will go, and where you stay I will stay. Your people will be my people and your God my God.". When most of us think of a Biblical passage about marriage, 1 Corinthians tends to spring to mind, but I happen to think that this verse from Ruth is even better. As a military wife, I found it especially fitting, what with the constant moves and uncertainty and all. But isn't this what marriage is about? Being a team, going through life-whatever it throws at us- together? Ruth 1:16 Cross: Of course, I could not pass up the matching cross. So stunning and another great reminder to keep Christ in all areas of your life and marriage as well. The Love Dare and/or Fireproof: Aww, Fireproof, one of my absolute favorite movies and one that I believe all married couples (or soon to be married couples) should watch. The Love Dare is what the movie is based on and also a great addition to your book collection. These serve as a great reminder to keep on going no matter what fires life throws at you! As Warren Beddingfield's song from the film says, "Love is not a fight, but it's something worth fighting for". Chocolate. Oh yes, no Valentine's Day gift basket would be complete without chocolates! These may all be great gifts for the newlyweds, but they're also the perfect reminder of what is so wonderful about sharing your life with the one you love. No matter how long you've been together, or what you've been through, take the time this Valentine's Day to remind your spouse how much you still love them...and how you'd marry them all over again!! What gifts from Family Christian would you give your spouse to remind them how they are loved? Oh....I love this! You found some awesome products for the basket. The basket you put together is awesome. I wish there was a Family Christian store close to where I live. My husband and I have been married 12 years. Something like this would make a great Valentine's gift for him. Awww, this is so sweet! And being a milspouse of 30+ years, I love the idea of Ruth 1:16 as the "go-to" verse. Great basket! Such a sweet idea! I love it and you found such wonderful items for the basket!! So sorry to read you had a miscarriage - my husband and I went through one this last fall. What a lovely idea! All marriages take work and dedication like this. Thanks for sharing! Fireproof and The Love Dare are awesome - and I'm not married! I think they're both good for anyone to check out really. Those mugs are super cute. Sometime I wish my husband drank coffee. Congrats on being married for 8 years. What a great gift basket! My husband and I recieved the Dare book and Fireproof one year for Christmas! It was just one of the things we needed for sure! Great post! 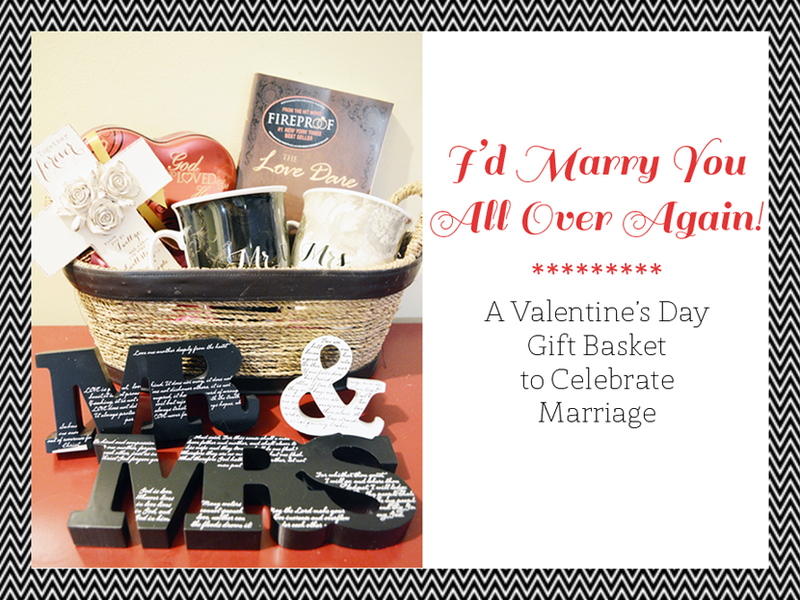 These are awesome ideas for a Valentine's gift basket! My husband and I have been together over 20 years and we are still madly in love! I'm going to do a basket for him with some of these ideas! This is a lovely gift basket. I think thoughtful gifts are the best ones. I agree on Fireproof. Such qn awesome movie!